Bloop - bloop. Yes, hunnies, I just decided after watching part three of the Real Housewives of Atlanta reunion special that it is officially time for Mrs. Lenethia Nene Leakes to exit stage left. Aside from the fact that I am sick and utterly tired of staring at Nene's helmet head on everyone episode, her sense of entitlement and disrespect for her cast mates is disgusting! Nene is that typical chick that's only good at one thing (poppin it on a handstand for coins), someone throws a few stacks at her and makes her feel important and all of a sudden, she has her bellpepper nose stuck in the air. I have said it before and I'll say it again, Nene is threatened by Kenya Moore. Nene knows her reign is over. She and her "fifteen thousand dollar" Hermes bag can bounce! And take that fifty dollar wig with you, moose! 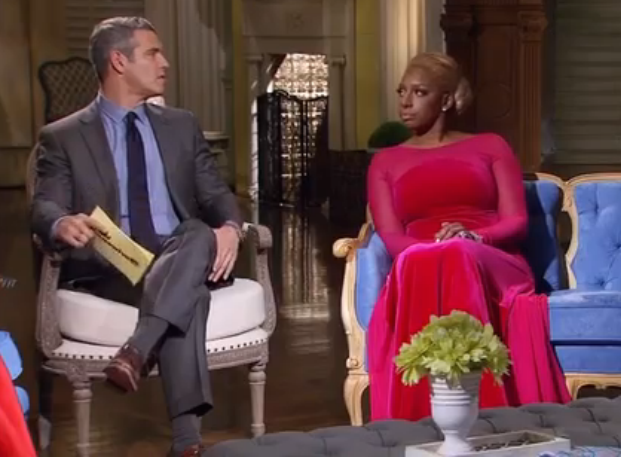 What did you think of parts 1, 2, and 3 of the Real Housewives of Atlanta Reunion? I'm looking forward to next season because you know some changes are about to come. Porsha Stewart is more likely out the door, and I can see it coming down to either Nene or Kenya being forced to leave. There can only be one H.B.I.C. In other news, I have been completely slacking on the blog updates and I apologize to all of my readers. I am looking for a few talented writers who are interested in contributing to Real Reality Gossip so if this is something you (or someone you know) would be great at, please hit the inbox!